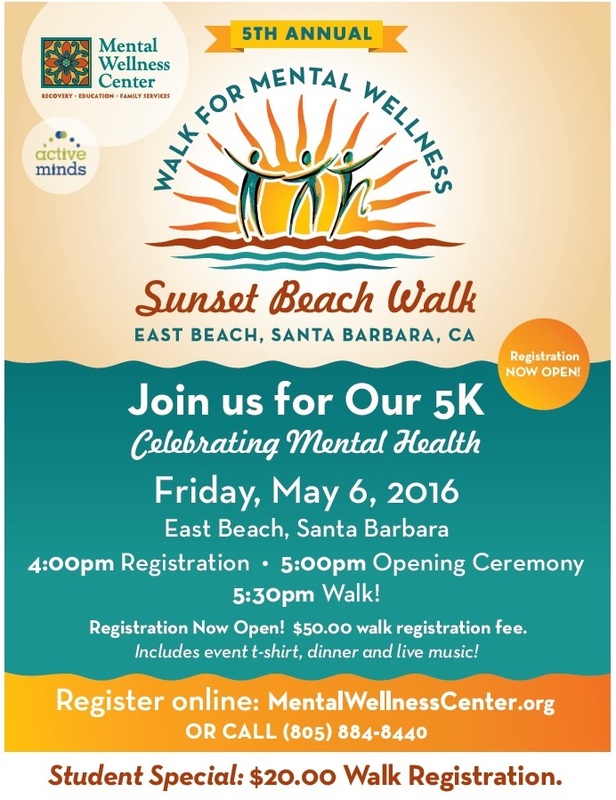 Active Minds at UCSB and the Mental Wellness Center of Santa Barbara wants you to end your school week celebrating your mental health and well-being on Friday afternoon, May 6, 2016, by joining them at the 5th Annual 5k Walk for Mental Wellness in Santa Barbara at East Beach. To register, use the link below to join the UCSB WALKERS team! Student Special: $20.00 walk registration! Includes event t-shirt, dinner (courtesy of East Beach Grill), live entertainment, and transportation to/from campus (transportation is limited, so please follow the instructions in your registration confirmation email and contact Active Minds at ucsbactiveminds@gmail.com to reserve your seat on the bus. Please be advised, the bus will leave campus promptly at 4pm). Opening ceremonies commence at 5pm and the walk begins at 530pm. Dinner & live music follow the walk, and transportation back to campus will depart promptly by 730pm.